I wasn’t planning on running this race! I had originally put my name down but then after my exploding appendix fiasco I had decided I probably wasn’t strong enough. However last Wednesday there was a last minute drop out and after a desperate plea on facebook from my coach, I decided I could at least give it a bash – but ONLY if it was leg 1 of the race (see lasts years race report to find out why I’ll probably never do leg 2 again)! Our 2 teams for the day. 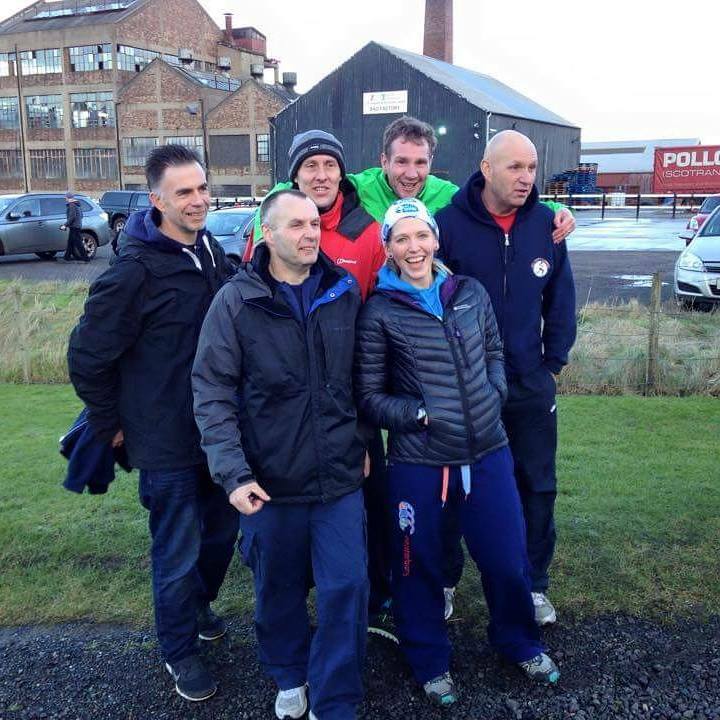 Always a brilliant day out with my wee running club! 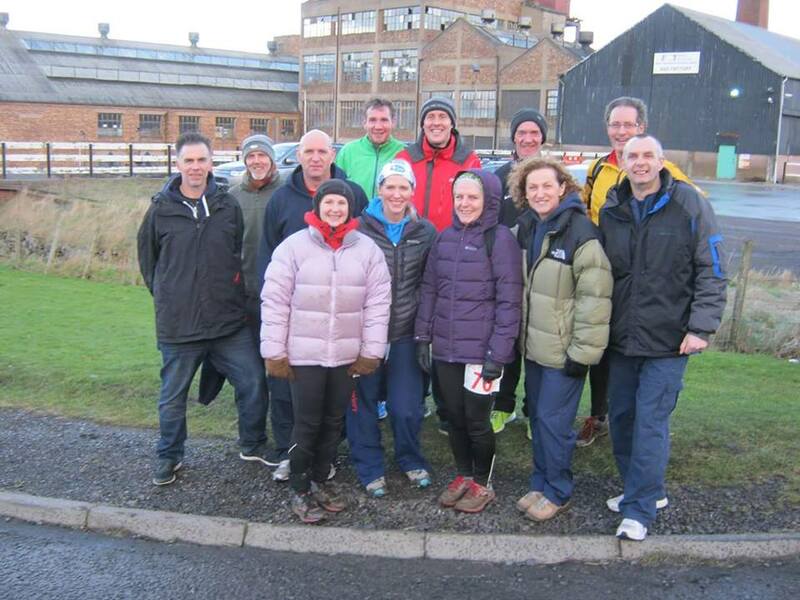 The Devil’s Burdens is an annual event held by Fife AC in late January and usually our first club event of the year. Last year we had terrible weather, I was shattered and could hardly shift my legs up the hill and after a freezing 2 hours in the hills and face planting into a bog I had reservations about ever running that particular leg again, but I knew I wanted to try other sections; preferably ones that didn’t involve near vertical climbs up the side of a mountain! So this year, luckily, the person who pulled out had been down to run leg 1 of the course and having had my eyes on this particular section after last years event, I was more than up for giving it a bash. This year there had been some slight changes to the course. Leg 1 was still a single runner and leg 2 still a pair and were both following the same route as last time, but this year to try and solve parking dilemmas and mad dashes round to the start of leg 4, leg 3 was now slightly longer and run in a pair and leg 4 started much closer to the original starting point meaning the leg 4 runner could just stay at the start and be ready without the stress! If you are interested in having a look at the course routes they can be found here. After meeting at the local leisure centre, our 2 teams bundled into 3 cars and set off on the 45 minute journey through to Falkland in Fife. Falkland is a beautiful small town full of lovely old building and narrow winding roads but unfortunately is not the ideal starting location for hundreds of runners along with their cars and families in tow…just getting into the town was hard enough never mind finding a parking space! However, we eventually found somewhere safe to leave the car (not exactly a parking space, but it would do! ), got registered and made it into the village hall in time for the race briefing. The R.D took to the stage to go over the rules and one which was emphasised again and again was that “all runners must wear full body cover, or at least have it with you, at all times; even those running leg 1”. Damn.. I had planned to wear shorts and long socks seeing as leg 1 wasn’t exactly on the hill but he had said that any team failing to follow these rules would be automatically disqualified. 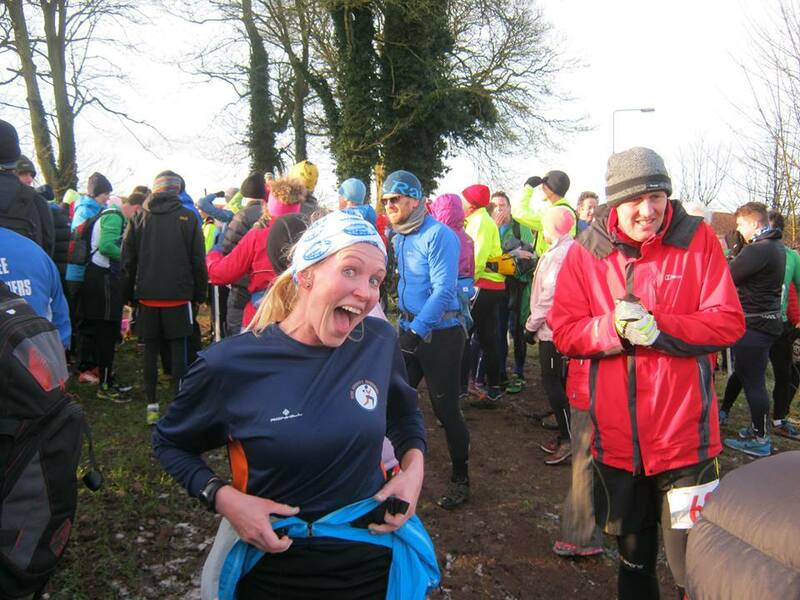 I wasn’t going to let my team down, so after a super quick change into leggings and minor panic trying to get my number pinned on, I was legging it down to the start line (which is a good 5 minutes away from the village hall!) with just enough time to get my breath back and calm down before the race started. Once at the start line I found myself surrounded by runners who were built of pretty much nothing (hill runners are a breed I am yet to fully understand) but also wearing close to nothing. Shorts and a vest top? Not even with long socks or a long sleeved base layer? How on earth was that full body cover?! Some did have waist packs but the majority didn’t. If they were indeed carrying extra layers, they must have had them packed away pretty cleverly; I wasn’t even going to ask where they might be! Bang on 9.30am and we were off. The pack spread out quickly and I found myself quite far up the field. No, no, no.. this wasn’t the plan! I was meant to hold back for the first mile or so and see how things were going! We turned off the tarmac and onto a frozen farm track that I had to navigate carefully so as not to go over my ankle.This lead onto a forest trail which was the perfect running surface but by now I’d trundling along so quickly I was roasting! Cue much faffing about trying to get my jacket off and tie it round my waist whilst keeping my speed up and not veering off the path into a tree. Chaos. We then hit a small hill and I used this to slow my pace and get into a good rhythm, except 2 minutes later I found myself flying back down the other side of the hill and speeding up once again. By now we were just over 2 miles in and despite noticing another hill just ahead I decided to push on a try and keep the pace up as I was still overtaking people. Up the hill, people were slowing right down and I pushed on by them, knowing there would be a downhill soon and as soon as it arrived I opened up and again and flew down the hill towards the control point. 2 card stamps meant a little wait as the there were a few people in front of me and they weren’t quite sure which box to stamp, and then it was back down the forest trails avoiding huge iced over puddles and more frozen muddy paths towards the change over point. I successfully navigated my way along the side of the very icy cycle track, only once getting whacked in the arm by a gorse bush, and bounced through the field to hand over my check card to Gordon and David ahead of schedule. Job done! Surrounded by cold people and I can’t get my layers off fast enough! Leg 2 was up and over West Lomond so we estimated around an hour and a half for Gordon and David to run the next leg. We bundled into Scott’s car and made our way round to Strathmiglo but once there realised we still had plenty of time until they’d be there, so carried on along the road to a cafe for coffee, bacon rolls and cake. All of us, even though I was the only one who had done work so far! Soon enough it was time to get going and ready to send off our next, now fully fuelled, pair. The end of leg 2/beginning of leg 3 is at the bottom of a very steep hill. As the runners come down, a fair share of them will take a tumble into the bracken and mud in front of the crowd which has gathered at the bottom of the hill. One lady fell and somehow managed a forwards roll, a backwards roll and then a quick bow to show she was OK which got a huge cheer from the crowd below. Rather them than me!! Gordon and David arrived and after a super quick change over we watched Scott and Derek disappear back up the hill (nearly on their hands and knees it’s that steep!) and then another quick dash back to the car to get Stephen back to Falkland for leg 4.The start of the final leg is in the middle of a forest so after having trouble finding parking and then walking for a good 10 minutes up to the change over point, we arrived to find Scott an Derek already there and waiting for us!! Note for next year – leave the leg 4 runner behind in Falkland, no matter how much they want a bacon roll!! We walked back through Falkland and round to the finish line where not too long after Stephen finished his leg and we celebrated with a cup of green soup and a buttered roll, all kindly supplied by Fife AC. Once both teams were finished we decided not to stick around in the stinky hall for the prize giving, but to make our way down the road for a well earned drink and catch up. Another fantastic team day out and for once, no one got lost! Only a few minor injuries (gorse bush, cuts from ice, sore bums from slips), 12 smiling faces and everyone raring to do it again next year and already fighting over what leg they’re not doing again. Unsurprisingly, leg 2 was mentioned as not a favourite once again. I wonder who we can trick into running it next year…. Although it’s tough, it’s definitely a beautiful race. The weather this year was prefect and I was told from the top of the Lomonds you could see over to the snow covered mountains in the Southern Highlands. There are still plenty of pictures to go up, but here are a few of the official ones so you can see for yourselves just how stunning this race is! Official photos. I hope to see a few of you there next year. I’m going to go for leg 3 I think!